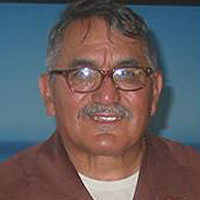 1916 2005 Lalo Guerrero, trovador chicano presente! So crooned Eduardo “Lalo” Guerrero to the tune of “O Sole Mio” (at the same time Elvis Presley used it for “It’s Now or Never”), reflecting the daily Chicano life of mexicano culture meeting gringo corporate realities. Known by all as Lalo, the Chicano trovador (troubadour) extraordinaire sang, composed and played mariachi, swing, bolero, boogie, mambo, cha-cha, rock and norteño music, often in poignant yet comic parodies, from the time of the Great Depression until he passed away March 17 in the Palm Springs suburb of California’s Coachella Valley. Guerrero was born Christmas Eve 1916 in the poorest barrio that housed the families of workers in the copper mines, rail yards, foundries and fields around Tucson, Ariz. His father was a boilermaker for the Southern Pacific railroad. One of 24 siblings, he was taught guitar and song by his mother and he worked at it all of his life. Growing up in the borderlands, Guerrero became adept at crossing over culturally, but not so much commercially, outside the barrios. He played the circuit of cafes, bars, dance halls and clubs along the rail lines and migrant farmworker routes, adapting his unique repertoire to the changing musical tastes of both sides of the border, decade after decade. In some ways he was a latter-day Chicano Woody Guthrie and an organic musicologist, an early Taj Mahal or Dave Van Ronk who specialized in barrio blues.In 1937 he wrote and composed “Cancion Mexicana,” which hit the top of Mexican mariachi charts. Between gigs in 1941 he worked on B-24 bombers for Consolidated Aircraft. In 1949, ever the Chicano, he wrote and composed “Los Chucos Suaves” (the cool guys), which was featured in Luis Valdez’s play and movie “Zoot Suit,” about a notorious 1942 racist attack by servicemen on Mexican American youth wearing the distinctive baggy clothing. The song was written in caló, the “Spanglish” street slang of the zoot-suited pachucos. It celebrated the popularity of the mambo over swing, boogie and jitterbug at the time. In 1955, Guerrero’s parody of Davy Crockett, Pancho Lopez (“The King of Olvera Street”) was so popular on both sides of the border that Walt Disney did not sue — instead he signed Guerrero to record the hit, earning the singer enough royalties to open a nightclub in East Los Angeles. Though not a professional philosopher or politician his obra (work) reflected upon the realities of mano de obra barata (cheap labor), or discrimination, exploitation and the collective community culture and struggle to overcome. He played catchy tunes, but his lyrics are etched in the minds of generations of Chicanos. Lalo Guerrero’s genius came from his close contact with the people; it broadened and deepened with the movimiento chicano/a. Perhaps his most classic work came in 1990 with the nostalgic ballad “Barrio Viejo,” recalling in old age his childhood days in the Tucson barrio that, bit by bit, has been bulldozed away. It ends with Lalo asking to be buried in the soil of that barrio so they could both be “difuntos rodeados de mil recuerdos” (defunct ones surrounded by a thousand memories). Three of his songs will soon be released on “Chavez Ravine,” a CD by guitarist Ry Cooder. In 1996 he received the President’s Medal of the Arts from Bill Clinton. In 1980 the Smithsonian Institute named him a National Folk Treasure. Lalo the performer touched millions of lives personally. My mother and her siblings and friends were contemporaries of Lalo in the Tucson colonias and barrios. 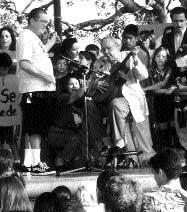 At a family reunion memorializing my mother, two days after Lalo’s death, stories were told of how my uncle, Rodolfo Urias, had Lalo accompany him to serenade his soon-to-be wife, Artemisia. Mom’s lifelong friend Alva Ruiz recalled how she interviewed Lalo in the 1930s as likely the first Chicana Spanish-language radio DJ in Tucson. My cousin Ricardo spoke of how his grandfather, Quiroz, sang in a mexicano band with Lalo. My sister-in-law Rosemary said her dad, Ernesto Durazo, and buddies palled around with Lalo in the ’30s as well. Indeed, Papa Lalo was — and is — presente!